The Cobblers have signed Scunthorpe United attacker Luke Williams on loan until the end of the season. 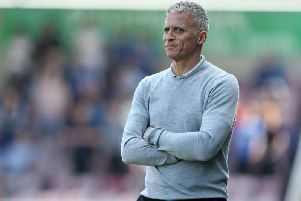 The 23-year-old agreed to a deal to switch to Sixfields on Thursday evening, and is set to make his Town debut in Saturday’s crunch Sky Bet League One clash with Coventry City. Williams is 6ft 1in tall and can play in a number of attacking positions, including striker, winger and in behind a front two. He began his career at his hometown club Middlesbrough, coming through the north east outfit’s academy and making 42 appearances for the first team. Loan spells followed with Hartlepool United, Scunthorpe United, Coventry City and Peterborough United before he made a permanent move to Scunthorpe in the summer of 2015. In all, he has made 30 starts and 14 substitute appearances for the Iron, scoring seven times. This season, his opportunities have been limited and he has made just one start in league one, as well as five others in the cups, making a further seven appearances from the bench. He has scored two goals this term to date, and they have both come in the EFL Checkatrade Trophy against Cambridge United and Oxford United. His most recent appearance for Scunthorpe came earlier this month in a 1-1 draw with Posh, and he was an unused substitute in the Iron’s 2-1 win over the Cobblers at Sixfields a fortnight ago. In his career to date, Williams has scored 14 goals in 67 starts and 39 substitute appearances. He has also represented England at under-17, U19 and U20 levels, scoring three goals in 17 appearances for his country, with one of those coming in a 2013 FIFA U-20 World Cup Finals group match against Iraq. Among Williams’ England team-mates at that tournament in Turkey were Harry Kane, Ross Barkley, John Stones, Eric Dier and James Ward-Prowse.